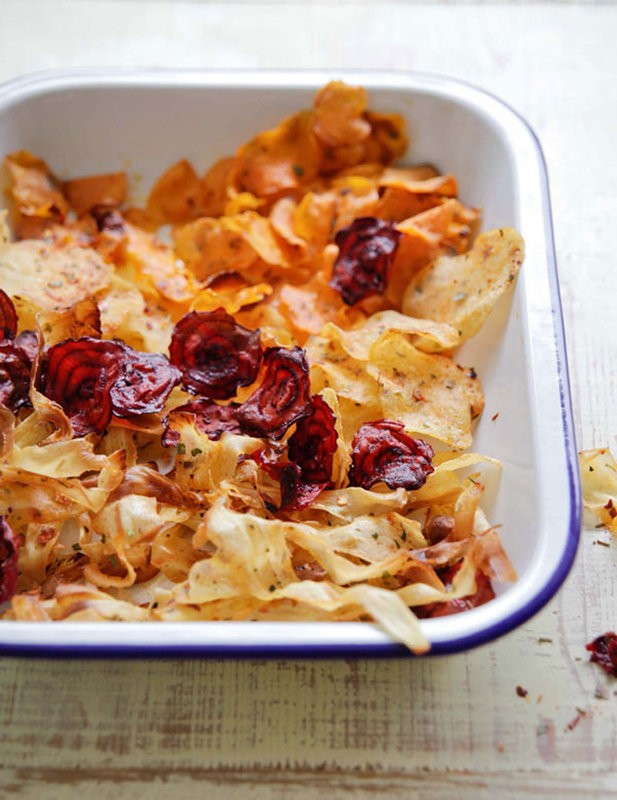 Baked vegetable crisps – use up root or starchy vegetables for a delicious Friday or Saturday night treat. Adele MacConnell has been blogging on her vegan website, Vegie Head, since 2010, and her recipes have been enjoyed and recreated by tens of thousands of people all over the world. She believes you can change people’s perspective on veganism and vegetarianism without scaring them away with statistics, facts or disturbing images, or by listing what they can’t do or eat. “Instead, you can show them what they can eat and that eating vegan food is an adventure in taste and ingredients” says Adele. 1. Preheat the oven to 180°C/350°F/Gas 4. Use a wire rack over a baking tray to cook the crisps – this will ensure they are evenly cooked and crisp up well. 2. Slice all the vegetables into uniformly thin slices, preferably using a mandolin. 3. Put the vegetables in a large bowl and drizzle with the oil. Sprinkle over the flavourings and mix well to cover the slices completely. 4. Arrange the slices on the rack in a single layer and bake for 10–12 minutes until crisp and lightly golden. You may have to do this in batches. Cool and serve. Store vegetable crisps in an airtight container for up to 3 days. These days, staying in is the new going out, and homemade deli is the way to eat gourmet! 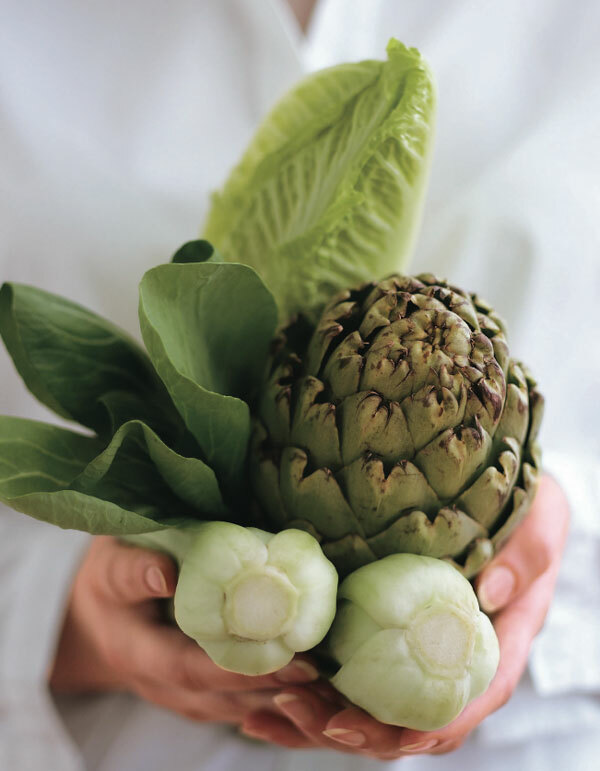 Emma Macdonald, a trained chef and founder of The Bay Tree – the UK’s premier deli ingredient company – shares her celebrated culinary secrets for the first time in her book The Bay Tree Home Deli Recipes. Try her delicious recipe for a vegetarian wellington – perfect for a Friday night supper. “The intensely fruity, ruby-red membrillo, or Spanish quince paste or “cheese”, is perfect combined with melting Camembert in these individual baked filo pastry wellingtons. Use a Camembert that is just ripe so that it melts but doesn’t run away during baking.” suggests Emma. 1. Preheat the oven to 190°C/375°F/Gas 5 and lightly oil a large baking tray. Brush both sides of each mushroom with olive oil and put them cap-side down on a plate. Season with salt and pepper. Using a sharp knife, slice the rind off the top and the bottom of the Camembert; you can leave the rind around the sides. Cut each Camembert in half crossways to give 4 pieces. 2. Put a piece of Camembert on top of each mushroom and top with a tablespoonful of the membrillo. Leave to one side. 3. Cut each sheet of filo in half vertically. Place 3 halves of filo on top of one another, brushing each layer with a little melted butter. Keep the remaining filo covered with a damp kitchen towel to prevent it drying out. Sit the stuffed mushroom in the centre and draw up the corners of the filo to meet in the middle and make a parcel. Twist the top of the filo to seal and brush the parcel with more butter. Repeat with the remaining stuffed mushrooms and filo. 4. 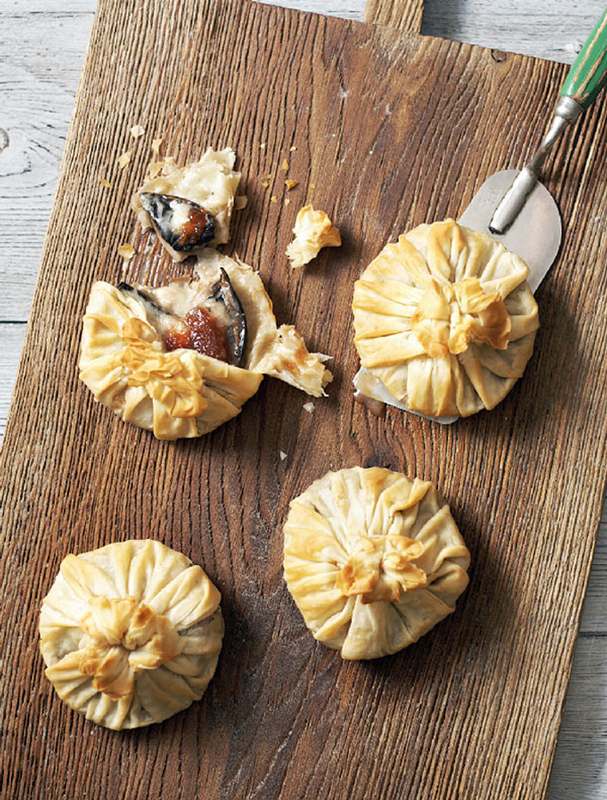 Place the mushroom wellingtons on the prepared baking tray. Bake for 25–35 minutes until the filo is golden and crisp. Leave to cool slightly to allow the Camembert to firm up before serving with potatoes and salad. Having grown up on the family’s delicious, homemade Cucumber Relish, Emma Macdonald had the simple idea that full-flavored, quality chutneys and preserves needed to be brought to the specialty sector. 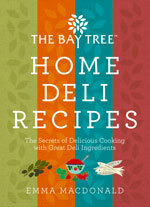 In The BayTree Home Deli Recipes she reveals all her deli-ingredient making secrets and shows you how to create delicious meals from them. £20 l Buy the book now! Are winter days getting you down? Plan an adventurous expedition for some time in the spring or summer to lift your spirits. Plan an adventurous expedition for some time in the spring or summer. Download a map from the internet and print it out on good strong paper. Annotate the map to show some of the excursions you might make. Read around the subject and write your most fascinating discoveries on your map. This then becomes your key for unlocking exciting surprises when the longed-for time comes – and to relish the prospect long in advance. Taken from Mind, Body, Spirit Book of Days Diary for 2014. This bestselling illustrated holistic diary series offers inspiring advice on how to find new value and delight all areas of your life – friendships, relationships, creativity, spirituality, health and well-being all through the year. Grace Cheetham’s delicious birthday cake. It can be difficult finding a birthday cake for a friend or relative with a gluten or dairy intolerance. But you can stop looking now! Not only does Grace Cheetham’s gluten-free chocolate birthday cake fit the bill, it looks and tastes divine too – no one will be able to tell the difference. “This heavenly birthday cake was inspired by one my sister made for her husband’s birthday. 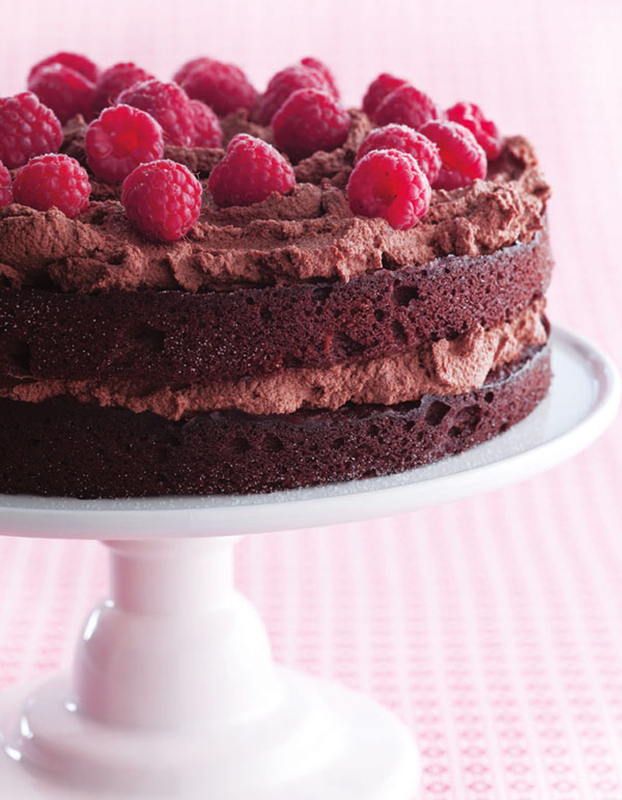 It’s light and moist, with dark truffley chocolate flavours and a rich, creamy icing, all covered with sweetly sharp raspberries” explains Grace Cheetham, author of Simply Gluten-free and Dairy-free. 1. To make the cashew nut cream put the nuts in a bowl, cover with cold water and leave to soak at room temperature overnight or for at least 12 hours. 2. Drain and rinse the nuts thoroughly, then put them in a blender. Add 250ml/9fl oz/1 cup water, the vanilla extract and dates and blend for 10 minutes or until smooth. 3. Preheat the oven to 180°C/350°F/gas 4 and lightly grease two 23cm/9in springform cake tins with dairy-free margarine. Put the chocolate in a large heatproof bowl and rest it over a pan of gently simmering water, making sure that the bottom of the bowl does not touch the water. Heat, stirring occasionally, until the chocolate has melted. 4. Using an electric mixer, beat the dairy-free margarine and sugar together in a large mixing bowl until light and fluffy. Beat in the vanilla extract, then beat in the eggs, one at a time. Using a large spoon, carefully fold in the melted chocolate mixture. Sift the flours, gluten-free baking powder and xanthan gum into the mixture and fold in. Make sure the mixture is well mixed but take care not to overmix it. Evenly divide the mixture into the cake tins and level the surfaces with the back of a spoon. 5. Bake for 35–40 minutes until firm to the touch and a skewer inserted in the centre comes out clean. Remove from the oven and leave to cool in the tins for 5 minutes, then turn out onto wire racks and leave to cool completely. 6. Meanwhile, put the chocolate for the icing in a large heatproof bowl and follow the same procedure as in step 1, above, to melt it. Put the blended nut cream and date mixture in a food processor or blender, add the melted chocolate and blend until well mixed. 7. Put 1 cake on a plate and spread half of the icing over the top. Put the other cake on top, flat-side down, and spread the remaining icing over it. Decorate with the raspberries and serve. Whether you’re suffering from allergy-related IBS, eczema, asthma, migraines or chronic fatigue, or you’re coeliac, Simply Gluten-free and Dairy-free will show you how to use substitute ingredients and simple cooking techniques to make mouth-watering meals. 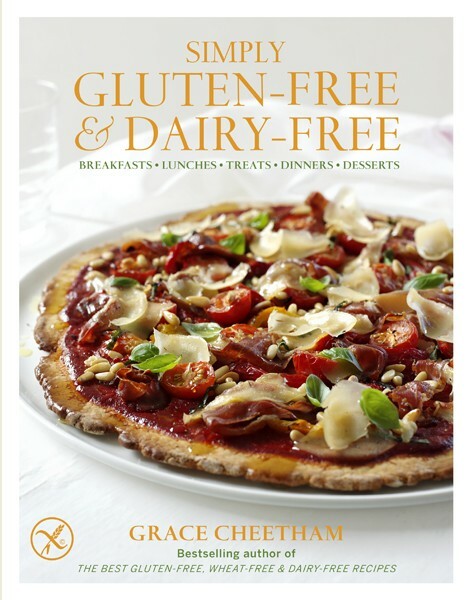 Find more inspiration on Grace’s award-winning blog glutendairyfree.co.uk. 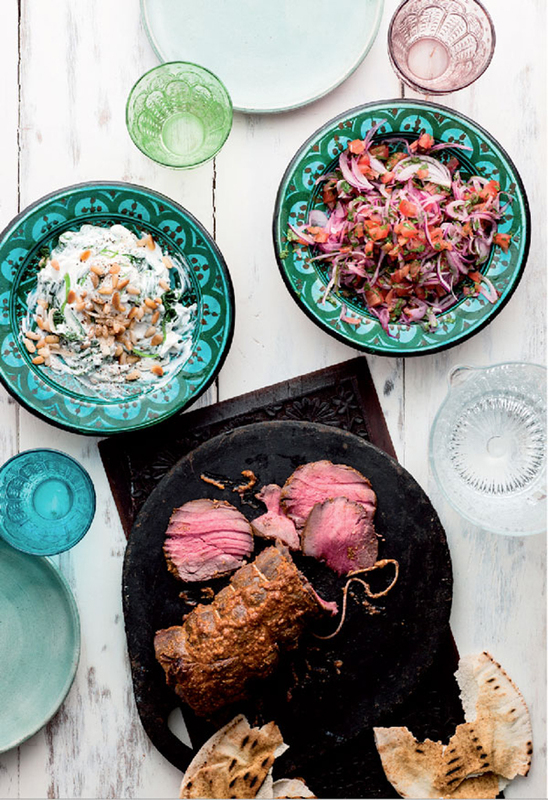 Beef Mezze – spice-encrusted roast beef, a spinach raita, a crunchy salad and warm flatbreads. Just add friends. Try this super-fast beef mezze recipe this weekend. Inspired by the Eastern Mediterranean, it’s a delicious platter of spice-encrusted roast beef, a spinach raita, a crunchy salad and warm flatbreads. 1. Preheat the oven to 200°C/400°F/Gas 6 and take the beef out of the fridge to come to room temperature. Peel the garlic, then chuck it into a mini food processor, and add the paprika, cumin and ground coriander. Add the olive oil and a good pinch of salt and pepper. Squeeze in the juice from the lemon and blend until smooth. 2. Put the beef in a roasting tin, then tip over the paste and rub it all over the beef. Roast for 30–35 minutes until charred on the outside and beautifully tender on the inside. 3. While the beef cooks, peel and slice the garlic for the raita. Heat the oil in a wok over a high heat and add the pine nuts. Stir-fry for 30 seconds until golden, then remove from the pan and leave to one side. Add the garlic to the pan. Stir-fry for 30 seconds until golden, then add the spinach and a pinch of salt. Continue to stir-fry for 2–3 minutes until the spinach has completely wilted. Tip the spinach into a fine sieve and leave to drain. 4. To make the salad, peel and finely slice the red onions, then chuck them into a mixing bowl. Squeeze in the juice from the limes and add a good pinch of salt. Mix together and leave to one side. 5. Using the back of a spoon, squeeze any excess moisture out of the spinach. Tip into a serving bowl and add the yogurt, then squeeze in the juice from the lemon and season with salt and pepper. Mix well, top with the pine nuts, then cover. 6. Cut the tomatoes for the salad in half and squeeze out the seeds, then finely chop the flesh and put it into the bowl with the onions. Finely chop the herbs and add them to the bowl. Pour over the oil and add a pinch of pepper. Mix well. 7. Pop the flatbreads into the oven for 2 minutes to warm through. When the beef is cooked, remove it from the oven and transfer it to a carving board. Slice the beef and serve it with the warm flatbreads, spinach raita and salad. Oh, and a glass or two of red. 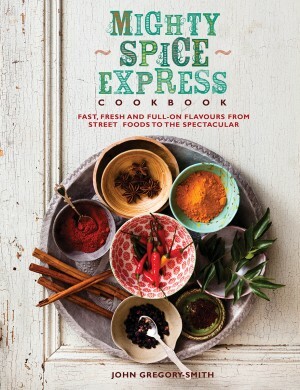 ‘Spice master’ John Gregory-Smith shows how exciting food – inspired by street stalls all over the world – can be prepared with lightning speed. With inspiration from Asia, South America, North Africa and the Middle East, John has done the thinking for you and created recipes that are full of brilliant time-saving techniques and shortcuts. The best way to lose weight? Be happy! We all know that certain hormones can make us happy, but did you also know they can help you lose weight? By paying attention to the natural hormones in our body, you can to shed excess weight easily, keep it off for good, and feel happy and energetic at the same time! 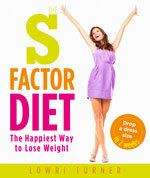 Lowri Turner, author of the S Factor Diet, shows you the science behind this revolutionary diet. 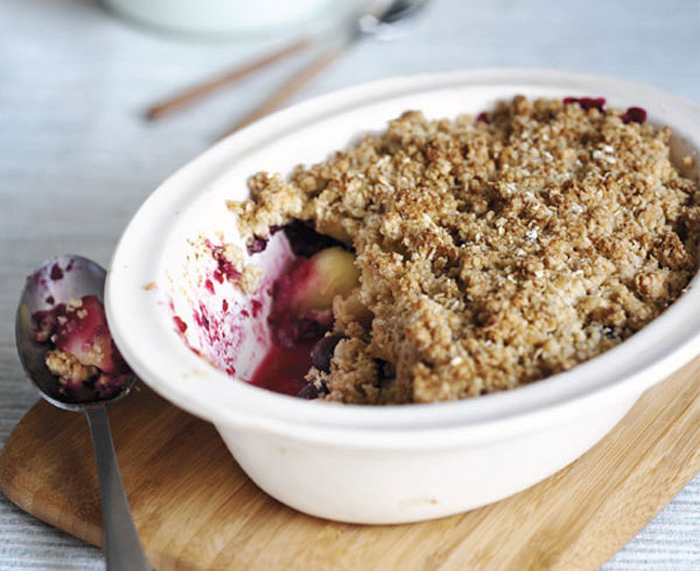 And you can try her delicious guilt-free crumble and ice cream recipe this weekend. “Diets don’t work, right? Old-fashioned ones certainly don’t. They make us feel depressed, lethargic and, when our weight shoots back up again afterwards, fat!” says broadcaster and journalist turned nutritionist, Lowri Turner. “Now you can say goodbye to those awful negative feelings. The S Factor diet tackles the cause of overeating and cravings. It’s specifically designed to make you feel good about yourself, so you can forget the “diet blues” and feel motivated to eat well and exercise”, explains Lowri. She believes that overeating can be a physiological attempt to correct imbalances in what she calls the S Factor hormones – natural chemicals we’re all supposed to produce in abundance, but which some of us don’t. When we’re low on these hormones, we feel low, and we try to boost our mood with unhealthy foods. S Factor hormones control how hungry you feel and how satisfied you are after eating. Serotonin: The “Good-Mood” Hormone. Good levels of serotonin make us feel calm, contented and cravings-free. Low serotonin affects sleep, makes us feel depressed and turns us into chocoholics. Dopamine: The “High-Motivation” Hormone. Dopamine is a chemical released in our brains in response to a reward or treat. Low dopamine weakens our resolve when the office feeder proffers cupcakes, and makes walking past the chocolate display in the petrol station a nightmare. Leptin: The “I’m-Not-Hungry” Hormone. Leptin tells our brain when we have enough body fat and then reduces our appetite and speeds up our metabolism to burn off any excess. That’s what it’s supposed to do, but as you become overweight, it stops working properly, so you feel fat and hungry. Adrenals: The “Stress” Hormones. This group of hormones, including adrenaline and cortisol, is pumped out by the adrenal glands. The right amount of adrenal hormones gives us energy. Too much and we become tired, wired fridge-raiders. “From a lot of complicated science, my simple message is this: you can lose weight if you get your S Factor hormones working properly”, says Lowri. Let’s get the “Tofu! Yuck!” reaction out of the way. Making ice cream from tofu slashes the fat content. You can’t taste the tofu and instead you get the delicious flavour of the natural vanilla. This is a sorbet-style ice cream so don’t let it freeze too hard. 1. To make the ice cream, put the milk, natural sweetener and vanilla pod in a saucepan and heat over a low heat for 3 minutes until the natural sweetener has dissolved. Remove the pan from the heat and leave to stand for at least 1 hour to allow the vanilla flavour to infuse into the milk. 2. Strain the mixture into a blender or food processor, discarding the vanilla pod. Add the tofu and process until smooth. Pour the mixture into an ice cream maker and process according to the manufacturer’s instructions. Alternatively, transfer the mixture to a freezer-proof container, cover with a lid and freeze for 1–2 hours until completely frozen. 3. Meanwhile, make the crumble. Preheat the oven to 200°C/400°F/Gas 6. Peel, core and chop the apples. Put the apples and agave syrup in a saucepan and simmer over a medium-low heat for 5 minutes until the apples have softened. Remove the pan from the heat and gently stir in the blueberries. Pour the mixture into a baking dish. 4. Put the oats in a food processor and process until they resemble coarse breadcrumbs. Transfer to a bowl, add the natural sweetener and cinnamon and rub in the butter with your fingertips. Evenly sprinkle the crumble mixture over the top of the fruit and bake for 15–20 minutes until golden. Divide the crumble into 6 equal portions. Serve hot with a scoop of the ice cream. With over 70 recipes to help balance your hormones naturally, Lowri Turner shows you how to shed excess weight easily and keep it off for good. https://nourishbooks.com/wp-content/uploads/2014/01/s-factor-preview.jpg 300 340 Victoria Lagodinsky https://nourishbooks.com/wp-content/uploads/2018/04/NourishLogo340x156-300x138-300x138.png Victoria Lagodinsky2014-01-23 00:00:372015-09-17 16:24:42The best way to lose weight? Be happy! 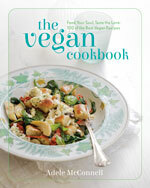 Author of The Vegan Cookbook, Adele McConnell has been blogging vegan recipes on her award-winning website, Vegie Head, since 2010. 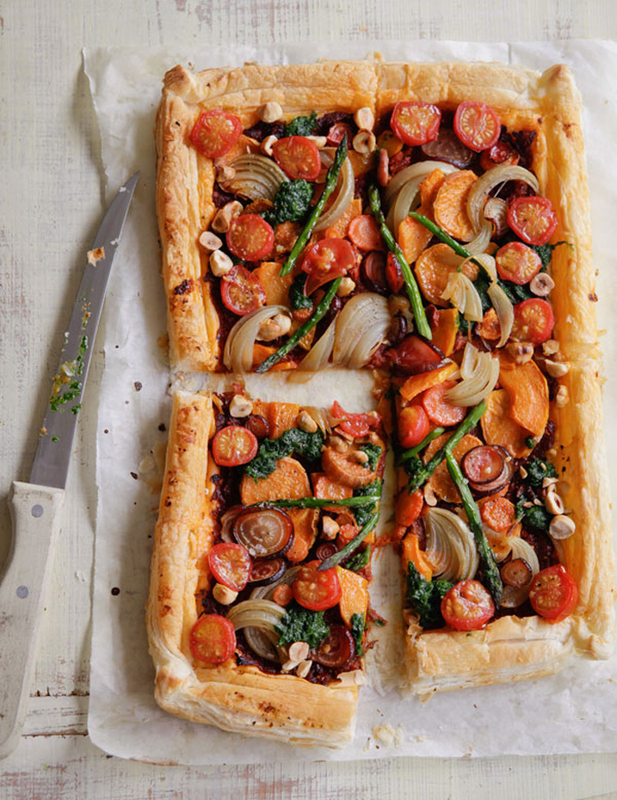 Try her rustic vegan tart recipe this weekend, and discover vegan food that’s packed with flavour! Adele McConnell’s recipes have been enjoyed and recreated by tens of thousands of people all over the world. She believes you can change people’s perspective on veganism and vegetarianism without scaring them away with statistics, facts or disturbing images, or by listing what they can’t do or eat. “Instead, you can show them what they can eat and that eating vegan food is an adventure in taste and ingredients” says Adele. “There’s no feeling of deprivation. 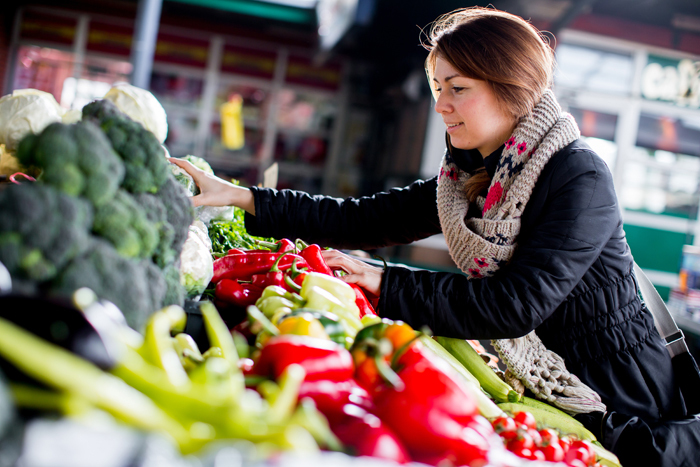 There is only an abundance of healthy, filling, incredible food. Try my Rustic Vegan Tart with Spinach Pesto and you’ll be convinced”. 1. Preheat the oven to 200°C/400°F/Gas 6. Put the sweet potato on a baking sheet and add the beetroot, squash, carrot and onion, then drizzle with the oil. Roast for 45 minutes. 2. Meanwhile, snap off any woody ends from the asparagus stalks at the point where they break easily, then cut the tender spears into short pieces. Leave to one side. 3. Put all the ingredients for the tomato spread into a blender or food processor and blend until smooth. Leave to one side. 4. To make the spinach pesto, put all the ingredients in a blender or food processor and process until finely chopped. Add a little water if the mixture is too thick. 5. After 45 minutes of roasting the vegetables, add the asparagus to the baking sheet and roast for a further 10 minutes. Remove the baking sheet from the oven and leave to one side. 6. Lay the pastry sheet on a clean baking sheet, and spread with the tomato spread, leaving a 4cm/1½in border. 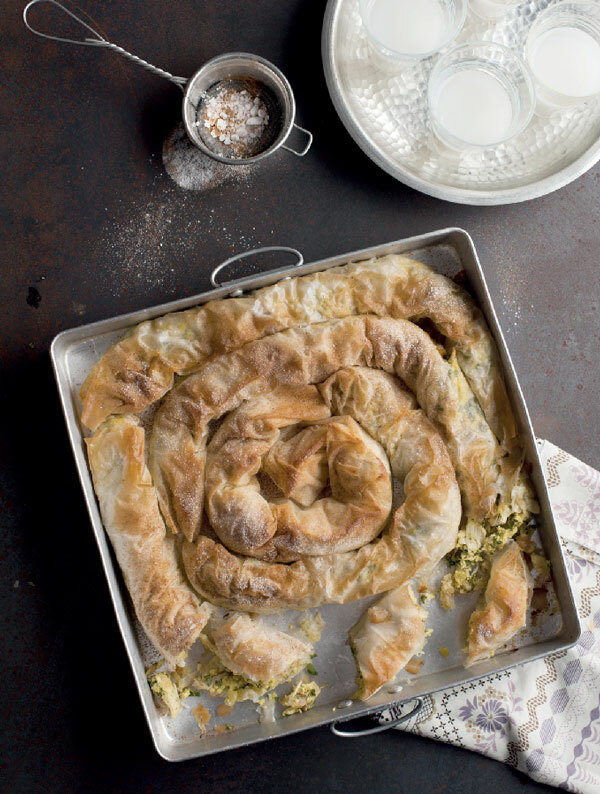 Arrange the vegetables in a pile in the centre of the pastry, and gently fold in the edges to make a pastry border. Scatter over the cherry tomatoes. Bake the tart for 15 minutes, or until the pastry is golden brown. Drizzle the tart with the spinach pesto, then sprinkle with the chopped nuts. Serve with a big green salad. This is an interesting thought isn’t it? We can all relate to the preoccupations involved in changing or breaking negative habits, but it’s such a wonderful and uplifting turnaround to decide instead to adopt a new habit; it sounds a lot easier for a start. Happiness, like anxiety, is contagious. 1. 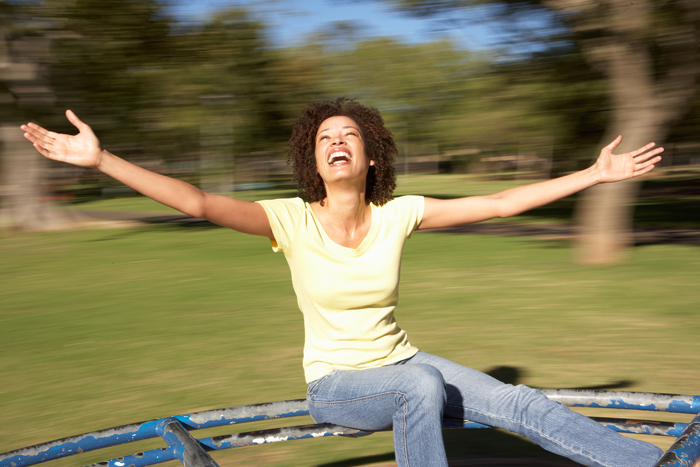 Do something fun and frivolous – you are guaranteed to capture some carefree childlike energy. 2. Slow down and ‘smell the roses’. Try this when you next find yourself rushing madly from pillar to post and recognize how it feels to stop and take a breather – you deserve it. 3. Stay in the moment. Try this now by bringing all your attention to this very instant. We burden ourselves with anxieties about the future and regrets and recriminations about the past – let them go and step into the NOW now! 4. Appreciate, appreciate and then appreciate some more. A self-explanatory top tip, begin this immediately. 5. Sing in the shower and start the day with a wonderful lifting of the spirits. 6. Perform an act of kindness, and you will definitely catch some happy vibes. 7. Be glad for this day. You are a unique and incredible human being, make the most of your opportunities. 8. Smile, smile, smile. 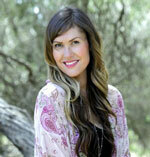 The physical act of smiling triggers a rise of endorphins (otherwise known as happiness hormones). 9. Be wholehearted about whatever you do. If a thing’s worth doing, it’s worth doing properly. My dad was always saying this to me when I was a child and now I know how right this is. Give yourself to life and life will love you back. 10. Celebrate your successes. How often we rush on to the next thing, moving the goalposts as we go. When you can stop and recognize your achievements you nourish your feelings of self-respect and happiness. 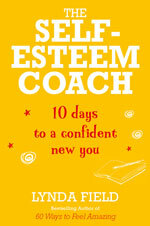 From the bestselling author of 60 Ways to Feel Amazing and Weekend Life Coach, here’s a fresh new take on how to increase your confidence in every area of your life –The Self-Esteem Coach is the complete DIY feel-good guide for the 21st century. Follow Lynda on her inspiring website lyndafield.com. £8.99 l Buy the book now! This pork stew recipe is perfect for your slow cooker. You could even prepare it before work, and come home to a warming winter meal. “Don’t be alarmed by the quantity of dried herbs in this recipe – it isn’t a typing error! After the stew simmers in the slow cooker for eight hours, the herbs mellow and the flavour of mint shines through. I find this dish particularly welcome in the middle of winter, when dried herbs really come into their own” says Beverly LeBlanc, author of I Love My Slow Cooker. 1. 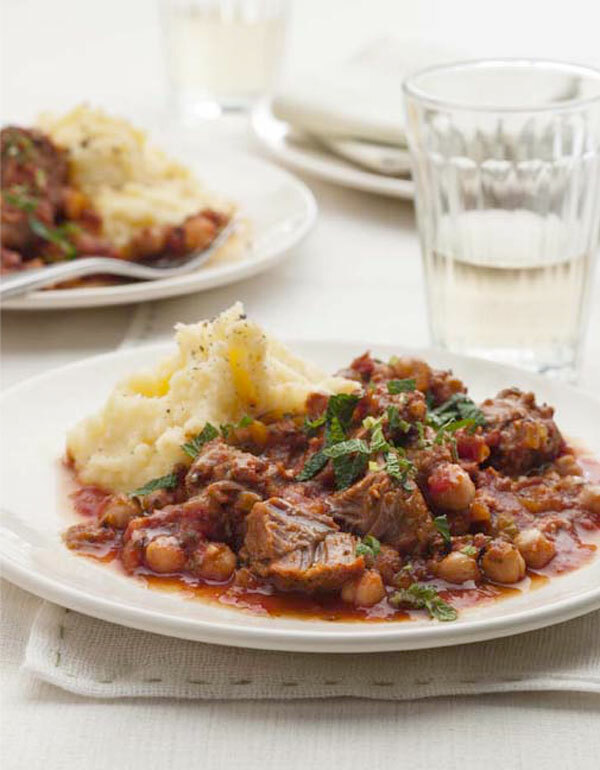 Put the pork, chickpeas and plum tomatoes in the slow cooker. 2. Heat the oil in a large frying pan over a high heat. Reduce the heat to medium, add the onion, carrot and celery and fry, stirring, for 2 minutes. Add the garlic and fry for a further 1–3 minutes until the onion is softened. 3. Add the passata, stock, dried herbs and sugar, then season with salt and pepper and bring to the boil. Boil, stirring, for 3 minutes until the liquid has reduced by about one-third, then pour the mixture into the cooker. Stir well and add extra stock, if necessary, to just cover the chickpeas. 4. Cover the cooker with the lid and cook on LOW for 8 hours until the pork is tender. Add a little more salt and pepper, if you like. Sprinkle with mint and serve with soft polenta. 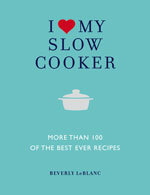 I Love My Slow Cooker gives you more than 100 slow cooker recipes for hearty soups and starters, tender meat, delicious poultry and fish dishes, inspiring vegetarian dishes and divine desserts. Each recipe is devised to take the stress out of cooking for yourself or your family. This weekend, try Bethany Kehdy’s Chicken Basteeya recipe from her stunning debut book, The Jewelled Kitchen – it’s the perfect centrepiece for a relaxed evening with friends. “Traditionally, basteeya is a sweet and savoury delicacy made from pigeon layered with crushed almonds and egg, enclosed in a filo-like pastry. I decided to add a literal twist to the recipe by shaping the basteeya into snakes and replacing the pigeon with chicken” explains Bethany. 1. Heat the oil in a deep, heavy-based frying pan over a medium heat. Add the onion and fry for 5 minutes or until soft and translucent. 2. Season the chicken with salt and pepper and add it to the pan. Sear for 3-4 minutes, browning on both sides, then drain off any excess fat. Add the garlic, ginger and turmeric and cook for 1 minute until aromatic, tossing the chicken to coat. Cover with 500ml/17fl oz/2 cups water and simmer for 30 minutes or until the juices from the chicken run clear when the thickest part of a thigh is pierced with the tip of a sharp knife. 3. Remove the chicken from the broth, leaving the broth in the pan, and set the chicken aside to cool in a bowl. Continue cooking the chicken broth until it has reduced by about half, then whisk in the eggs one at a time until the eggs and broth form a scramble. You may find you don’t need to use all the eggs. Set aside to cool. 4. Once the chicken has cooled slightly, shred the meat and discard the bones. Add the herbs and lemon zest and juice to the chicken. 5. Grind the almonds to a rough paste in a food processor, then mix in the icing sugar, cinnamon and orange blossom water and stir to combine. Add this to the chicken along with the egg mixture. Stir to combine. If convenient, you can prepare the recipe to this stage one day in advance. 6. Preheat the oven to 200°C/400°F/Gas 6. Remove the sheets of filo from their packaging and cover them quickly with a damp kitchen towel to stop them drying out. Working with one sheet at a time, evenly spoon 4-5 tablespoons of the chicken mixture along the long edge of a filo sheet. Roll the pastry tightly into a long tube. Repeat with the remaining filo sheets and chicken mixture. 7. Transfer the rolled sheets to a 30cm/12in square or round baking tin. Starting from the outer edge, add the filo rolls as you work inwards to cover the base of the tin like a coiled snake. Drizzle the melted butter over the coiled pastry and bake in the oven for 25–30 minutes or until golden brown. Lightly dust with cinnamon and icing sugar, then slice into small, bite-sized pieces. Serve the basteeya warm. Looking for something with zing? 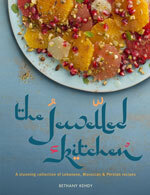 Try Bethany’s Moroccan Citrus Salad for a vibrant and refreshing taste of North Africa. Sufferers of SAD often have reduced levels of serotonin during the winter months. Serotonin plays an important role in regulating appetite – when we’re low in serotonin, we often feel more hungry. As many carbohydrate foods are rich in tryptophan, the precursor to serotonin, this may explain why we want to reach for foods like bread, pasta and pastries. These foods can cause imbalances in blood-sugar levels, which can trigger further increases in appetite and cravings. The good news is that you can make changes to your eating habits today that will have profound and long-lasting effects on your winter mood. If you ticked five or more symptoms, you may suffer from SAD or Seasonal Affective Disorder. SAD is essentially caused by lack of sunlight, so it’s important to get as much natural daylight as possible. Your body makes most of its own vitamin D when your skin is exposed to sunshine. Even on a dull day, you’ll still benefit from spending time outside. 1. Eat a protein breakfast. Including protein at breakfast helps reduce cravings and control appetite. 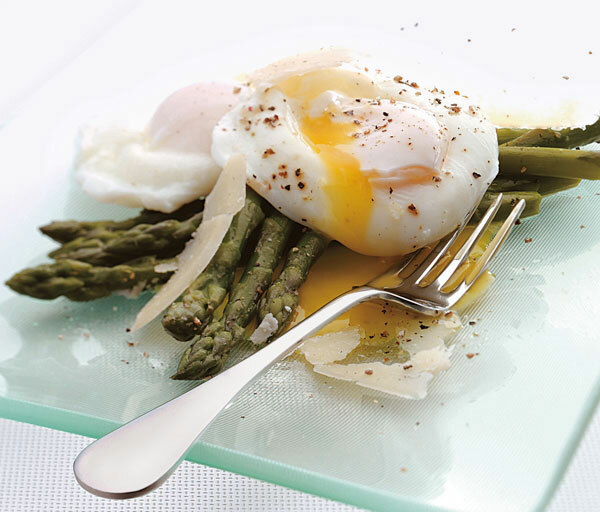 Try our recipe for poached eggs and asparagus (below) or a protein shake, nuts and seeds, or fish. 2. Balance blood sugar. Swings in blood sugar are one of the major causes of cravings so keep blood sugar stable. Eliminate sugars, fizzy drinks, fruit juice, artificial sweeteners and refined carbohydrates. Combine good protein foods with healthy fats and slow-releasing carbohydrates. 3. Include snacks during the day. Eat a couple of healthy protein-rich snacks during the day and don’t allow yourself to become too hungry. 4. Avoid eating within three hours of bedtime. This can actually increase insulin levels and may increase cravings as well as disturb blood sugar and sleep patterns. 5. Get sufficient vitamin D – not only is this important for boosting mood, low levels of vitamin D may also impair your appetite control. 6. Take natural supplements for cravings. Consider a supplement to help balance blood sugar that includes chromium. L-glutamine powder can also be very effective. 7. Include soluble fibre – this helps you feel fuller for longer and aids blood-sugar control. Eat foods such as beans, pulses, oats, nuts, seeds, vegetables and fruit such as apples and pears. Start the day with a runny poached egg on a bed of tender asparagus. Packed with B vitamins, iron and copper – all help in the production of neurotransmitters in the brain – plus it’s quick, easy and delicious! 1. Steam the asparagus spears for 3-4 minutes until tender. 2. Meanwhile, bring a pan of water to the boil, then reduce to a simmer and poach the eggs for 3-4 minutes. Remove the eggs with a slotted spoon and drain on kitchen paper. 3. Divide the asparagus between plates, dot with butter and lay two poached eggs on top of each asparagus bundle. Scatter over a little Parmesan, if using, and season well with black pepper. Find up-to-date nutritional science and comprehensive, accessible information on which foods to eat for optimum health and vitality in Lift Your Mood With Power Food. 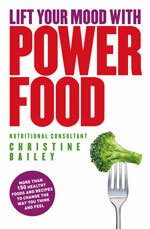 Lift Your Mood With Power Food by Christine Bailey. How to memorize your shopping list – and almost anything else! Try these 4 steps and you will be amazed at how easily you can memorize 10 items on your shopping list. You don’t have to stop there – you can easily adapt the technique to remember almost anything. Visualize the inside of your home. Imagine walking around its rooms from its main entrance to the kitchen, the lounge, the dining room, and so on, finishing in your bedroom. Establish 10 stages around the house at which you could place items that you wish to remember: the mirror in the entrance hall, the sink in the kitchen, the bedside table, and so on. Visualize the stages in the order in which you come across them. Mentally walk around your home, placing each of the following items in the correct order: cheese, milk, oranges, ice cream, cereal, bananas, bread, broccoli, fish, tomatoes. Be imaginative – the cheese is draped like a coat over the hall chair, the milk is running out of the taps in the kitchen sink, a tomato forms the base of your bedside lamp. Wait for an hour or so, and then imagine retracing your steps. As you come to each stage, the item that you placed there should come to mind. When you go to the supermarket, recall the mental journey around your house and you won’t forget a single item! Our brains are more likely to remain alert throughout our lives if we keep them healthy. Just as we take exercise to keep our bodies physically fit, and watch our diet to avoid illness, so we need to take care of our brain. Memory training provides an excellent mental workout, and if we make memory exercises part of our daily lives, and continue to expect our memory to serve us well, it is more likely to remain up to the task. 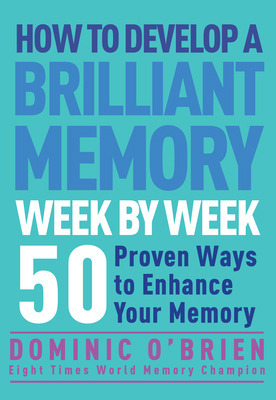 In How to Develop a Brilliant Memory Week by Week by Dominic O’Brien – eight-times winner of the World Memory Championship – offers us tried and tested strategies and tips that will expand your mental capacities at a realistic but impressive rate to make your memory bigger, better and sharper, week by week. https://nourishbooks.com/wp-content/uploads/2014/01/brilliant-memory-preview.jpg 300 340 Victoria Lagodinsky https://nourishbooks.com/wp-content/uploads/2018/04/NourishLogo340x156-300x138-300x138.png Victoria Lagodinsky2014-01-21 11:00:472015-09-17 16:47:34How to memorize your shopping list – and almost anything else!